Care2 Healthy Living | Basil Seeds Have Health Benefits. Who Knew? 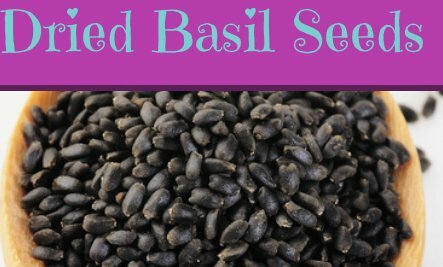 Listen to this interesting Green Divas Foodie-Phile segment about dried basil seeds, then read on to learn lots more about dried basil seeds AND get a couple of great recipes! Basil contains many polyphenolic flavonoids especially Orientin and Vicenin. These provide the antioxidant benefits. Basil leaves are rich in many essential oils like eugenol, citronellol, linalool, limonene, citral and terpineol. These provide antibacterial and anti inflammatory benefits. Low in calories and free of cholesterol. High levels of beta carotene, lutein, zeaxanthin, Vitamin A and Vitamin K.
Contains good amounts of minerals like potassium, manganese, copper, calcium and magnesium, and vitamins C and folates. Excellent source of iron at 40 percent RDA per 100 grams. Add 2 tsp. of dried basil seeds to ½ to 1 cup of a warm (not hot) liquid of your choice (water or juice). After the seeds swell, you can choose to drain the extra liquid or include it. As the seeds plump up, they will begin to release their antioxidants and digestive enzymes. Let the seeds stand in the liquid for at least 2 minutes, and watch them transform into a gelatinous-tapioca like texture. They will be ready to include in your favorite recipe. You are only limited by your imagination. You can collect these seeds from your own basil plants. Let the basil flower bloom, wither then dry. When the flowers are good and dry you can put the flowers on something flat and gently blow the debris away and collect the tiny black seeds. They are fully mature when they easily detach from the flowers. Always watch children and the elderly when drinking basil seed drinks. The seeds may clump together which could cause choking if not enough liquid is used to make the drinks. Pregnant women or those trying to conceive should not use basil since it lowers the levels of estrogen. In a bowl whisk almond milk, yogurt, vanilla and the 2T of maple syrup until blended. Stir to move the seeds around, cover and refrigerate for a few hours or overnight. When you are ready to assemble the pudding, mix the fruit with remaining maple syrup (if desired) and almonds in a separate bowl. For something even more decadent, you can add melted semi-sweet chocolate chips to the pudding mix. Make sure the melted chocolate is not too hot when you add it to the pudding. Combine 1 cup water and basil seeds in a pitcher and let it sit for 15 minutes. In a bowl combine basil seeds with ½ c water and let stand for 10-15 mins. Add the rest of the ingredients to a pitcher and mix. Written by Green Diva Lisa. I like eating basil leaves right off the plant. Thanks for the article and the recipes.